We are a horse-powered vegetable farm in the hills of central Maine. With the help of our four draft horses, fabulous staff, and useless but enthusiastic farm dog--we grow ten-acres of MOFGA Certified Organic vegetables that we sell to coops and small grocery stores across the state. While we take particular joy in the search for the perfect carrot, our diverse offerings allow us to have produce for sale winter, spring, summer and fall. As farmers, we take great pride in the quality of our produce, and the care we take of our land, animals and employees. We aim to create an efficient, productive and fun environment for our crew to work and grow! With an emphasis on clear communication and personal growth, our employees can expect to develop and build on their skills as farmers and farm workers. We have multiple positions open for our farm crew for the 2019 growing season! 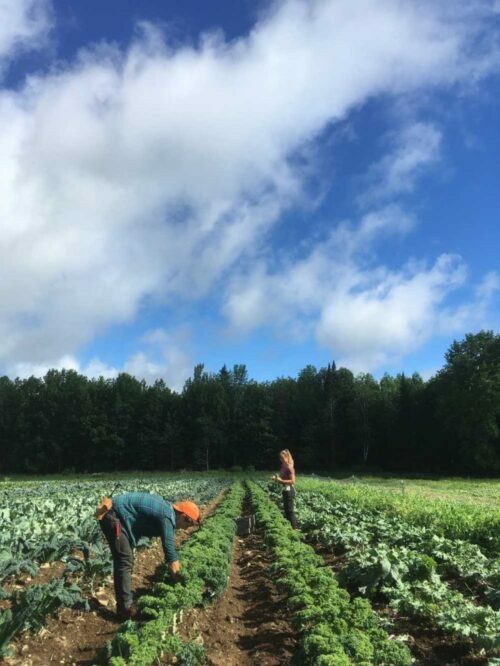 From the greenhouse, to the field, to the pack shed– employees will be knee deep (hopefully not) in the day-to-day operations of our organic farm. Together we make this place tick!! We are a group of young farmers who are passionate about good food, hard work, and making this a fun, rewarding place to be. Experience working on a farm isn’t necessary to apply but a strong work ethic and a positive attitude are a must. The days are long and the work can be tedious. Compensation: Individuals with commercial farming experience start at $12, with all the vegetables you can eat.